Her doctor is asking for prayers. 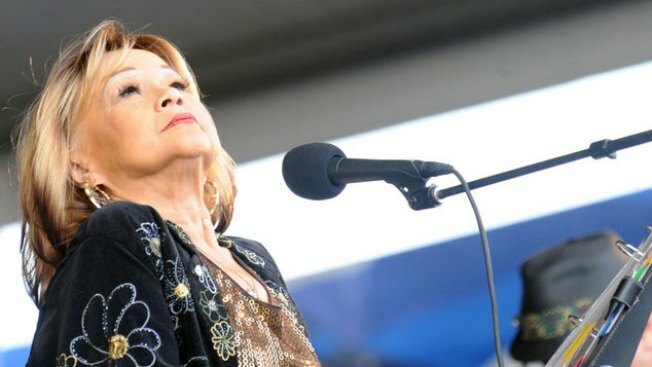 Recording Artist Etta James is terminally ill.
"At Last" and "Tell Mama" blues singer Etta James, whose health has been fading in recent years, is now terminally ill, and her live-in doctor is asking for prayers. Dr. Elaine James, who isn't related to the 73-year-old entertainer, tells the Riverside Press-Enterprise that the singer's chronic leukemia was declared incurable two weeks ago. The doctor has cared for Etta James at the singer's Riverside, Calif., area home since March 2010. Elaine James says she's spreading word of the singer's ailments so people will pray for her. She says fans know Etta James has been sick "but not how sick." Court records in the singer's probate case show she also suffers from dementia and kidney failure. Elaine James made her comments outside a Riverside conservatorship hearing over the singer's $1 million estate. The singer's son, Donto James, wants a conservator rather than the singer's husband, Artis Mills.